Pantasia Casino is a top online casino choice for players looking to sample Rival Gaming's highly touted collection of video slot machines (including its i-Slot collection). This Rival-Powered casino offers sharp and attractive graphics, as well as realistic casino audio that is sure to make you feel as though you're on the Vegas strip. Pantasia currently offers new players a 100% match bonus for signing up, up to $777 in free casino money. For those of you that want to give the casino a trial run before making a deposit of any sort, Pantasia gives all new sign ups $15 free! You read that correctly - you'll get $15 in free casino money merely for signing up. You don't even need to make a deposit to get in on real money play at Pantasia, and with a humongous library of games to choose from, you'll have plenty of opportunities to see what this casino has to offer. Pantasia Casino brings you over 100 games, including all of your favorite table games, slot games and video poker games. Card players will recognize popular games such as Blackjack (both regular and multi-hand), Baccarat, Caribbean Stud Poker, Three Card Poker, and more. If video poker is your vice, then you'll love Tens or Better, Joker Poker, Deuces Wild, Double Joker and several others. While all of these games will whet your gaming appetite, slot machine lovers are the ones that will truly fall in love with Pantasia Casino. The casino's video slot lineup consists of titles such as Gold Rush, Chicken Little, Major Moolah, Dog Pound, So 80s, and others. If you've heard the hype around Rival Gaming's i-Slots games, then you'll definitely want to check out As The Reels Turn, Cosmic Quest, Hole in Won, and several of the other i-Slot offerings available at Pantasia. If you're unfamiliar with i-Slot technology, the premise is simple: increase slot-player interaction like never before. I-Slots are multi-payline, multi-reel slot machines that are bolstered by interactive storylines. Players are treated to animated videos, games within the game, and many bonus features. No words can do these games justice, as they must be seen to be believed. Pantasia Casino accepts players from all over the world, including our friends in the good ol' US of A. 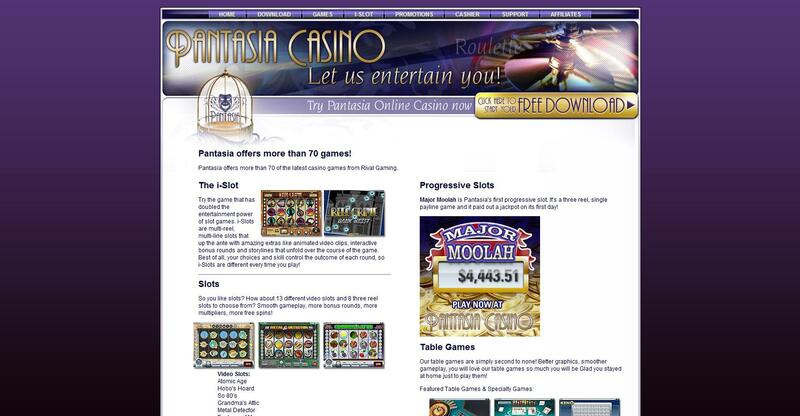 To get in on some of the hottest casino action on the net, download Pantasia's free software today!